Rob Roy, cattle dealer, thief, part rogue, part romantic hero, lived beyond Lowland law. He became a Highland Robin Hood - a legend in his own lifetime. Here's his fascinating story - plus a gazetteer of places you can visit. A real Rob Roy Macgregor did exist and it was his reputation as cattle-dealer, outlaw, swordsman and supporter of the poor that made him a legend. He was born in the Trossachs, at the southern edge of the Highlands in 1671. He was sympathetic to the Jacobite cause and became embroiled in the political plottings of the aristocracy. He was outlawed when his cattle dealing went awry but was eventually pardoned by General Wade in 1725. His skill as a swordsman was helped by the fact that he had exceptionally long arms (apparently). He probably didn’t look a bit like Liam Neeson. You can visit plenty of places in the Highlands of Scotland that are associated with him. His grave in Balquhidder kirkyard is just one of them. This is the story of the real Rob Roy Macgregor. Loch Voil and the Braes of Balquhidder. (Pictured here) Loch Voil and the Braes of Balquhidder. (Yes, it can be sunny there, too. Just not on the day I took this atmospheric pic.) This is where Rob Roy Macgregor spent the last years of his eventful life. View over Balquhidder Glen from Creag an Tuirc, clan rallying place. Rob Roy Macgregor was a real person, not a fictional character, although the many stories of his days as an outlaw made him into a kind of Scottish Robin Hood. He was a son of Lieutenant-Colonel Donald Glas (‘Pale Donald’ or Donald Macgregor of Glengyle) who had earned his title for services in the army of King Charles II. As a loyal supporter of the Stuart dynasty, he would have instilled this allegiance in his son Rob. He was born in 1671 in Glen Gyle at the west end of Loch Katrine. This glen was then a main cattle droving road from the west. Pictured here. Winter view over Balquhidder Glen, from Creag an Tuirc (the crag of the wild boar), the ancient rallying or gathering place of the local Clan MacLaren. Rob was brought up in the cattle business and took part in cattle droving in Scotland. This involved both legitimate dealing and other activities which were, uhmm, unofficial. He eventually became the head of a watch or squad that was paid to protect other owners’ cattle. Sometimes these activities received approval from the authorities – for example, the Scottish regiment, the Black Watch, was raised in 1725 as a government approved militia to combat cattle stealing. However, in Rob’s day the watches/squads provided security guards for other people’s cattle if they paid protection money. OK, OK – you’re right – it was just a protection racket. I was trying to make it sound more romantic. Rob was a skilled swordsman and expert in hill craft – these were in the standard job descriptions for cattle dealing in those days. He was also sympathetic to the Jacobite cause, that is, to those who wished the return of the exiled Catholic king of the House of Stuart. Rob’s expertise with weapons, his knowledge of terrain and his leadership qualities were of great interest to the Jacobite plotters. In 1693, Rob Roy married Mary of Comar, who was also a Macgregor. Comar was a farm on one of the Clan Gregor land holdings near today’s Loch Arklet, (pictured here) in the Trossachs. The site is still marked on today’s maps, at the back of Ben Lomond. In the picture here - a very green one, as it's high summer - Comar is out of the shot to the left. A succession of hard winters 1696-9 brought near-starvation to many in Scotland. Clans like the Macgregors, with homelands near the Highland edge, raided into the Lowlands for cattle in order to survive. This, naturally, did not exactly endear Rob Roy to several well-to-do Lowland families, particularly as he was so expert at ‘lifting’ cattle and moving them quickly back into Macgregor territory. Gradually, though, Rob’s legitimate cattle enterprises also prospered and he acquired a reputation as a trustworthy businessman. This, in turn, led to a business deal in 1712 with the Duke of Montrose who asked Rob to buy cattle for him for fattening and resale. The Duke gave Rob funds to buy the animals. However, it all went horribly wrong. Rob’s assistant absconded with the funds. Montrose, in great haste, declared Rob Roy Macgregor an outlaw, burned his house and seized his lands, without giving Rob any opportunity of repaying. Some commentators find this episode puzzling: as a government supporter, did the Duke of Montrose have a political motive, fearing that Rob could become useful to the Jacobites? Alternatively, was it simply the typical greed of the Scottish aristocracy? Was the Duke simply after Rob’s lands, which were then quite extensive, around Craigrostan on the east bank of Loch Lomond? In the period 1713-20 Rob Roy lived beyond the law. Having sworn revenge on the Duke, he frequently raided his properties, consequently becoming a kind of folk hero with the local tenantry. Most of the stories of Rob’s derring-do come from this period. Rob was also active in the Jacobite rebellions around this time. There is a statue of Rob Roy below the old town wall of Stirling (background in the picture). It recalls his prowess as a swordsman and the sculptor (Beno Schutz) gave him unnaturally long arms, though this is not evident here. What's left has a faint but unsettling resemblance to a hand grenade. In the confrontation between the government and the Jacobites, the main fighting took place at the Battle of Sheriffmuir in 1715. Some historians believe he was sent off on a special mission by the Earl of Mar, who was in charge of the Jacobite forces. Rob returned too late to the field to have any effect on the outcome of this indecisive battle. 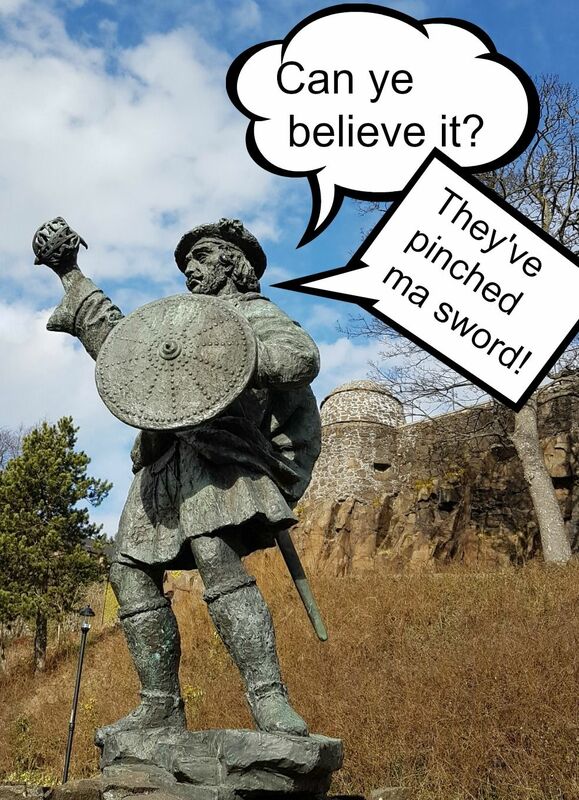 His activity (or lack of it) on the day has been a cause for historical controversy – with even Sir Walter Scott suggesting in a historically suspect introduction to his own novel Rob Roy that Rob was only interested in plunder and keeping clear of the action. Rob also took a part in the less well known episode in Glen Shiel in 1719. This is one of Scotland’s most scenically spectacular glens. Amid the soaring peaks and bolstered by the landing of a party of Spanish mercenaries (of all people! ), several Jacobite leaders had gathered their men and had intended to march on Inverness. Before they could proceed, they were attacked by a government force whose superior fire power dispersed them. There’s an Eilean Donan Castle connection that will have to wait for another day. Kirkton Glen, above Balquhidder, has changed greatly since Rob Roy’s day. Then it was quite an important route to the north. More on the Kirkton Glen walk, Balquhidder here. After these episodes, Rob gradually returned to living openly amongst his own people in Balquhidder, north of the Trossachs. Having, in his day, successfully evaded all the efforts of the British army to capture and hold him, he restarted his cattle business around 1720. A formal pardon was arranged through General Wade in 1725. Daniel Defoe, the author of Robinson Crusoe, meanwhile wrote Adventures of a Highland Rogue featuring the wily Macgregor whose folk-hero reputation was thereby further enhanced – even the King enjoyed the story! Rob eventually died peacefully at home in Balquhidder. The best (fairly) recent work on the story of Rob Roy is by the Scottish writer, the late WH Murray. Or if you prefer the Hollywood treatment, then Liam Neeson as Rob Roy is always entertaining. Though a fictionalised account of Rob Roy Macgregor was published, perhaps most famously by Sir Walter Scott, Rob was a real life historical figure. There are plenty of places around the Trossachs and Loch Lomond that have Rob Roy connections. Just before a kind of gazetteer of places associated with Rob Roy Macgregor, a reminder of how Sir Walter Scott helped ensure Rob Roy’s place in Scotland’s culture and folk lore. He published his story - the eponymous 'Rob Roy' in 1816. As in his earlier ‘The Lady of the Lake’ Scott set the narrative very much in real landscapes, so that visitors would be able to see the settings of episodes in the book. Scott heard many tales of the exploits of Rob Roy Macgregor – and even talked to old men who could remember Rob. In Scott’s novel, Rob became the symbol of a vanishing way of life – under threat from the Lowland-based government and the spread of industry and commerce. This does make Rob sound a bit like Butch Cassidy or his partner, but chronologically speaking, the clan system was dismantled after the last Jacobite misadventure at Culloden, only twelve years after Rob’s death. You can track down these places associated with Rob Roy Macgregor by taking the Trossachs tour from Edinburgh. His place of birth is marked by Glengyle House (greatly rebuilt since Rob’s day) which stands in Glen Gyle on the shores of Loch Katrine in the heart of the Trossachs. (This dwelling is private and can be viewed only from the nearby road). There is a Clan Gregor graveyard close by. Also in the same area on the north-west end of Loch Katrine are Portnellan farmhouse, on the site of the first house he occupied after his marriage, and another Clan Gregor graveyard. This one is just a little way beyond Portnellan, on a little causeway on the very edge of the loch, the gravestones themselves having been moved when the loch’s water level was raised when it became Glasgow’s water supply. It was after seeing these graves in their original position in 1803 that the English romantic poet William Wordsworth composed the poem ‘Rob Roy’s Grave’. However, he was mistaken in identifying this site as Rob Roy Macgregor’s last resting place (see below) though some say that Rob’s father, Donald Glas of Glengyle (d. 1693) lies here. Loch Katrine, at Stronachlachar, with Factor’s Island, right. Factor’s Island – pictured here, with the Stronachlachar pier on the left – is just off shore. Rob once held the Duke of Montrose’s factor to ransom here – one of many incidents in Rob’s private war with Montrose. The island was also reduced in size following the raising of the water level. 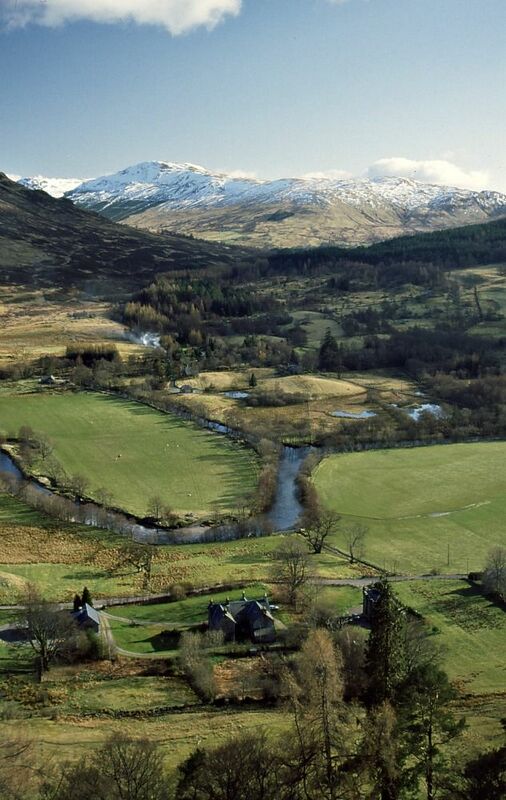 In Rob Roy Macgregor’s legitimate cattle-dealing days, he owned the estate of Craigrostan on the east bank of Loch Lomond now traversed by a long-distance footpath, the West Highland Way, north of Rowardennan. His house was at Inversnaid on the shore of Loch Lomond. Later, barracks were built (now in ruins and part of a sheepfold) further up the hill, to control the unruly Macgregors. Rob’s wife Mary (who was also his cousin and called Helen in Sir Walter Scott’s novel) came from Comar, a farm just north-east of Ben Lomond, reached only by fit walkers via forestry paths from the Stronachlachar/Aberfoyle road. Loch Arklet, east of Loch Lomond as well as Loch Katrine had many Macgregor families nearby – and there is an old rallying ground of the clan at the east end of Loch Arklet, though the area is altered with the damming of the loch in connection with feeding Loch Katrine. (Pictured here) Rob Roy Macgregor’s grave, in the kirkyard at Balquhidder, is a place of pilgrimage (of a kind) for many visitors. Rob Roy Macgregor’s grave, in the Balqhuidder kirkyard. This beautiful glen in Rob’s time was a settlement area of all sorts of landless clansmen, as well as a Clan Gregor stronghold. Rob eventually settled here and lived peaceably after 1720. He was buried with his wife in Balquhidder Church graveyard. Maps still mark the site of his house at Inverlochlarig (private) where the public road ends at a carpark towards the west end of the glen. Nearby Loch Lubnaig was one of the many places where he outwitted forces sent from Stirling Castle to capture him. He also escaped from Logierait Castle, near Dunkeld, after treachery by the Duke of Atholl and from the Duke of Montrose at the Fords of Frew on the River Forth. If you fancy staying in the Balquhidder area - which is very beautiful and peaceful, we can recommend Monachyle Mhor Hotel - this is a luxurious boutique hotel at the end of the glen. The cooking by Tom Lewis, the chef/proprietor is amazing. It is a great base for hill climbing, mountain biking or just chilling out. Nearer the main road A84 highway the same family run a cheaper boutique hotel called Mhor 84. Killiecrankie: 1689 battlesite near Pitlochry. Rob’s father, and possibly the young Rob Roy Macgregor himself, fought on the Jacobite side in the first effort to return James VII to the throne. Kippen: the scene of a notorious cattle raid by Rob and his men in 1691. Glen Dochart on the main Callander-Oban road, below Ben More: the site of Auchinchisallen, the farmhouse where Rob lived under Campbell protection, after being declared an outlaw. The remains of a house are (barely) visible from the main road. Inveraray Castle: Rob surrendered here to the Duke of Argyll, then lived for a time at Glen Shira nearby. Sheriffmuir: a battlesite in the Ochils, near Stirling. Rob took part on the Jacobite side in the 1715 uprising. Glen Shiel: Rob took part in a skirmish between government forces and Jacobites (including Spanish troops) in the 1719 uprising. The incident is recalled in the Gaelic name of one of the many high hills along the glen: Sgurr na Spainteach – Spaniards’ peak. Eilean Donan Castle: This famously picturesque castle on the road to Skye was totally destroyed by naval gunfire after occupation by a force of Spanish soldiers in the short-lived 1719 Jacobite rebellion. The castle lay in ruins until restoration between 1912 and 1932. Culter, Deeside: A kilted figure, said to represent Rob Roy, stands on a rock above a tributary of the River Dee, west of Culter (between Aberdeen and Banchory). It is visible from the main road. Burn o Vat, near Ballater: This spectacular rock formation on Deeside draws many visitors each year and is popularly associated as a hiding place of Rob Roy, though well away from his usual haunts. An outline tour to Stirling Castle and the Trossachs where tourism began. The Castle was once one of the most important anywhere in Scotland, while the Trossachs offer a real taste of the romantic and rugged Highlands. An interesting day out from the Lowlands and into the hills beyond. Scottish cattle droving was once important in our economy, notably when Crieff 'tryst' was a major cattle market, before railways ended the trade there.